Interestingly the thing I miss most since my seachange to Hervey Bay isn’t the Brisbane nightlife or social scene. It’s not the shopping or the array of cultural activities. It’s takeaway food options! I must first confess though that although I’ve whinged about this for two years I’m still only just getting around to trying some new places. After writing about this very issue in my ‘other’ blog last August I had a range of recommendations about Fraser Coast options… but most pointed me in the direction of Oriental Palace in Scarness. However, two weeks ago we finally made it. And enjoyed the experience. 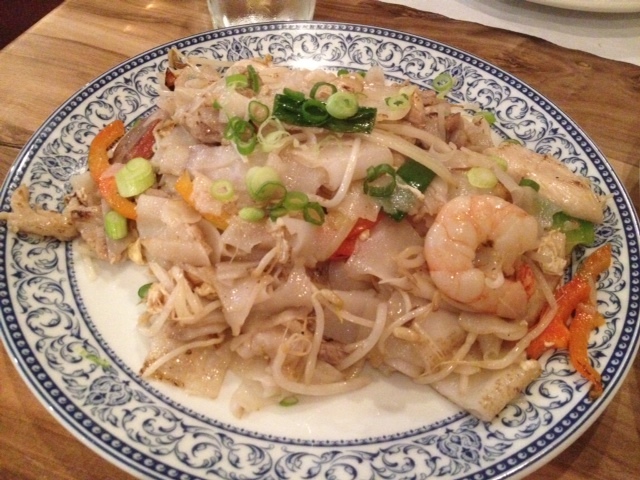 Oriental Palace offers Chinese and Malaysian cuisine. I’m coeliac so offered to go it alone and order my own gluten-free dish; allowing my friends to choose whatever they wanted. However, they kindly agreed to both order from the GF menu so I would be able to try a few different dishes. None of the entrees are GF, which isn’t unusual and my friends decided to forgo them anyway and nibbled on the vege chips provided while we sipped our drinks and gossiped discussed important social issues. We went for the: Chicken with cashew nuts & vegetables; Chilli beef & vegetables; and Cha-Kueh-Tiao (Malaysian Flat Rice Noodles (which comes with a range of meats). 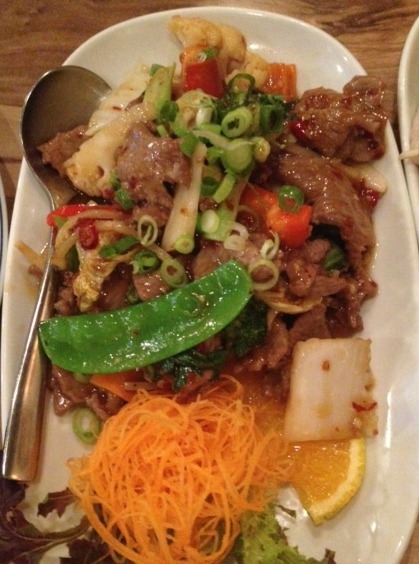 Service was very speedy and we agreed all three dishes tasted really fresh and healthy, although the Chilli beef won out on taste. The other two dishes were a teensy bit bland… but I suspect the chef had to eliminate sauces because of the whole gluten thing. It’s something I’m accustomed to but my friends asked for some soy sauce and I think that helped. So, while my old fave Brisbane haunt still holds a place in my heart, I’m pleased to have discovered Oriental Palace. We caught wafts of sizzling beef, Laksas and Mongolian lamb and the like and I suspect my dining companions opt for those next time they visit. I certainly would, if I could! 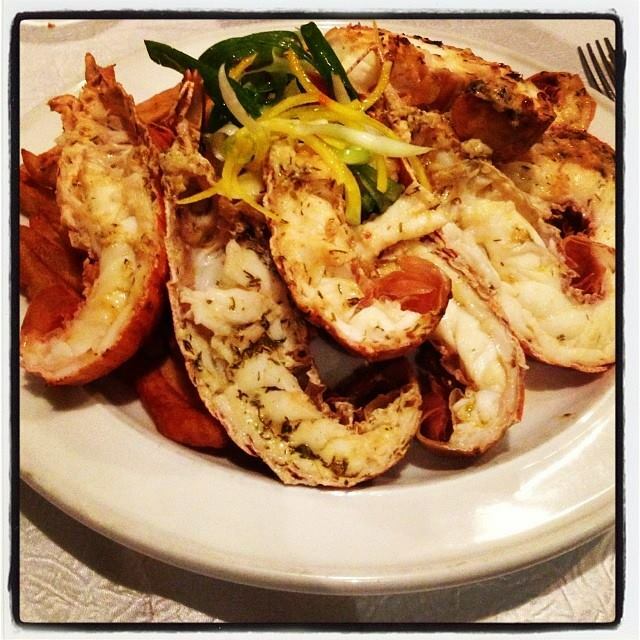 Oriental Palace 352 Esplanade, Scarness is open Tuesday – Sunday evening from 5pm. Most meat-based dishes are around the $20 mark and it’s BYO and licensed. Check them out on Facebook or call on 07 4128 3496. When a friend and I attended the Hervey Bay Food and Wine Festival back in October my friend (KangaRue – who occasionally blogs here) had a lengthy chat with peeps at the Wild Lotus Restaurant and Bar tent. I’d commented that I was impressed at how many of their dishes are gluten-free and LOVE that they clearly mark things on their menu as gluten-free and dairy free etc. KangaRue’s son is dairy allergic so that was a bonus for her as well and she returned with her steak sandwich making me promise we’d head there as soon as possible. Sadly it took us a couple of months but we finally had dinner there recently with another friend. We’d booked – which I think is generally recommended on a Friday or Saturday evening – and the place was quite busy (which is great given at how fickle the restaurant / cafe market seems at times). I’m actually on a weight loss program (Weight Watchers) and counting points so I’d sussed out the menu online earlier in the day in order to decide what I would eat and calculate my points. Plus the restaurant (showing increasing social-media savvyness of late, had shared a pic of their creme brulee (left) on Facebook during the day… cementing my decision that dessert was most definitely on the agenda. Entrees are usually one of my biggest problems when dining out (as I don’t eat seafood and gluten-free options are often minimal), but there were easily two or things I’d love on the menu at Wild Lotus. The Scotch Fillet Carpaccio sounded TO DIE FOR and the Asian chicken skewers would have made me very happy. However, we three had our minds set on the creme brulee so decided to forgo entrees for dessert. There’s a good variety of wines available but as I was designated driver for a change I stuck to the soft stuff. My buddies were a tad undecided about their mains – too many things that sounded delicious, but one ended up going for the seafood risotto and the other for the Moreton Bay bugs. I’d already decided on the rib fillet (medium rare of course) and LOVED that all of the sauces were gluten-free (a rarity when dining out). While normally I would have chosen something creamy, I ended up with the Mountain Pepper sauce though diet-wise could probably have gone for the Red Wine Gravy as well. My steak came on a root vegetable mash with some parsnip chips (or similar) on top. There was some cauliflower but that was easy to push aside :-). I could have had my steak with chips and probably normally would have but… well…. It was only week 1 of Weight Watchers, so I decided to forgo my personal faves for a change. 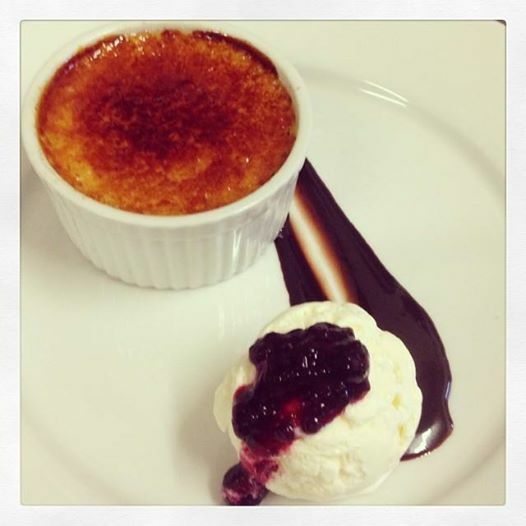 My fellow diners all agreed the creme brulee was perfect but weren’t sure it needed the berry compote and chocolate melted sauce on the side with the ice cream. I’d skipped the berry compote (cos, well… fruit!) so actually quite liked the drizzle of sweet chocolate. Meals were priced reasonably for a restaurant of that calibre, ranging from approx. $20-35 and entrees from $7; the service was great and our waiter very knowledgable. We’ll most certainly be going back. 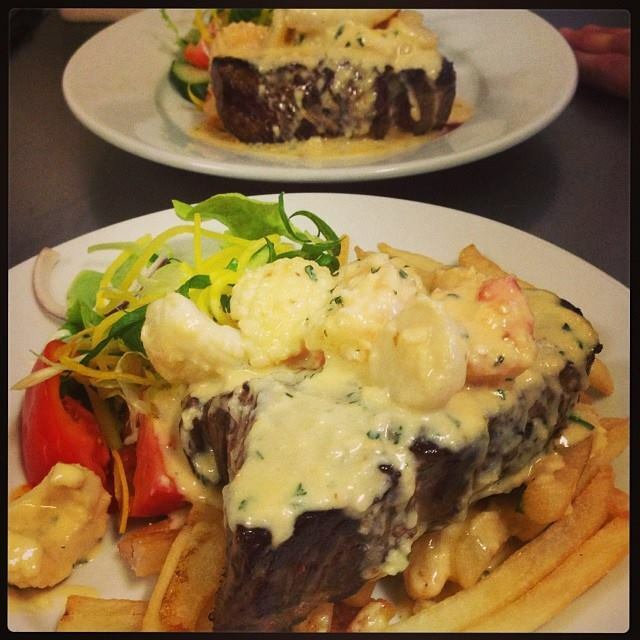 Wild Lotus Restaurant and Bar is open from Monday – Saturday for lunch and dinner. Check out their website or Facebook page because they also offer a range of specials. Bookings can be made by contacting 07 4125 3278. 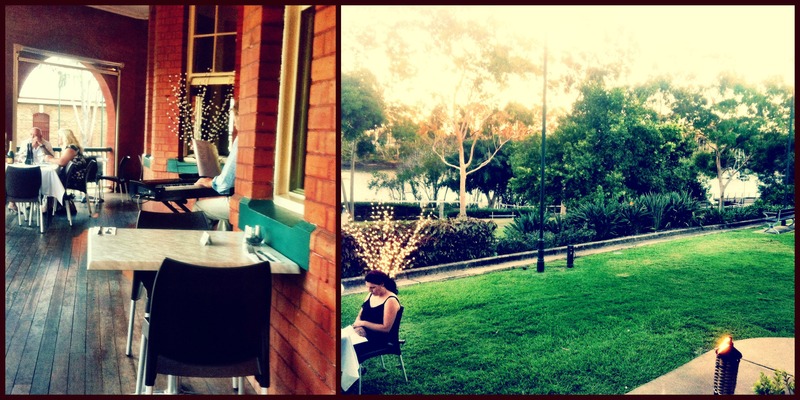 Last weekend I was fortunate enough to head to Maryborough’s Café Muddy Waters for dinner. It was only my second visit this year – the first ‘just’ after it reopened following the January floods. It’s a gorgeous spot – in the old Customs House building – still with lovely views of the river and fortunately (in its new location) at far less risk of flooding! In my previous review I cut the café a lot of slack given that they’d just reopened, but had been disappointed that gluten-free options were very limited. However, I’m pleased to say that is no longer the case. Of course – given my usual apathy and lack of organisation – I only emailed the night before I was due to go to ask about GF options. I got a response straight away and was advised there were heaps of choices on the menu. My fellow diners shared an array of breads and bruschetta as an entrée but scallops (etc) were also on offer. The beef was melt-in-my-mouth succulent and offset perfectly by the creamy potatoes and crisp beans. A citrusy* chicken dish proved popular with others at my table and another friend had the fish and chips. The special of the day (braised shoulder of lamb on what I think was a bed of couscous and topped with turnip crisps) also sounded and looked kinda yummy. I often suffer from food envy so feel obliged to check out everyone else’s meals within viewing range (ideally without scaring them). Pics from MW’s Facebook page. And the cake was magnificent. Like friggin’ unbelievable. Moist and rich without being too sweet. I checked with someone else at my table who’d had it just in case I’d hoovered mine too quickly but she confirmed its yumminess. Another of my group had the Vanilla Bean Panna Cotta and another a pav-like meringue dish*. We were sitting out on the verandah and had a lovely breeze throughout the night. All in all it was a lovely dining experience. The atmosphere is just gorgeous and there was a musician playing a keyboard in the background. It did get a teensy bit loud, but I expect that’s cos we diners all got very kinda loud as the night wore on. 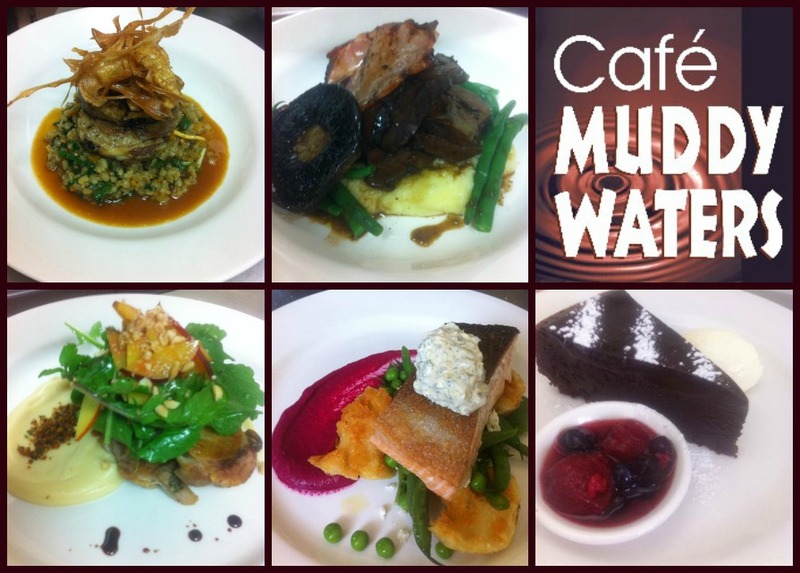 Café Muddy Waters is located at 103 Wharf Street, Maryborough, and is open Tuesday – Sunday (9am – 4pm) and Friday and Saturday nights from 6pm. Ph. 4121 5011. Or like them on Facebook.